Wills Memorial Building is a Neo gothic building designed by George Oatley and has become one of the most beautiful monuments in the city of Bristol. Nestled on top of Park Street the place sees a lot of tourists all-round the year due to its exotic design and infrastructural beauty. The building stands tall at 215 feet and is the third largest structure in Bristol. So take a day out and visit this beautiful building and be amazed by the man-made marvel. Buses from Park St Top (Stop db) or Queen's Road (Stop Dd) can take you there. Trains from Avis Bristol Temple Meads Train Station can be taken to the location. How popular is Wills Memorial Building? 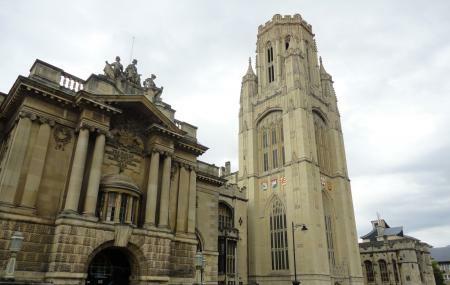 People normally club together The Cabot Tower and Bristol Museum & Art Gallery while planning their visit to Wills Memorial Building. Beautiful building and an impressive first point of entry to the university. I only visited the main hall which is impressive of itself, but long round trip to the loo! Entry to the building can be restricted so don't just wander in- you might be told off! There are tours up the tower on selected days of the month (check their website for exact dates) for a small fee but make sure you book in advance otherwise you may not get a space. Took a fantastic tour of thr building. Daniel was incredibly knowledgeable and approachable. Fantastic to see Bristol from a different perspective. If you are in Bristol, this is something you definitely don't want to miss. Bank Holiday Mondays at 1pm. Every Sunday at 12 and 1pm, only £4 for students. Great place to visit. Lovely views and great staff. The 1pm Saturday tour is a must. For just £5, of which profits are donated to the local Childrens Hospital Charity. You get to see inside the great hall, library, climb the tower and see the bell Great George strike. Tours last 90 minutes and we booked in advance to reserve a place. Thanks for a grand day out!